Hello 2019! And, hello new tax rules for homeowners! Just when you thought your taxes were predictable, Congress passed some dramatic tax reforms. While everyone will be affected when filing 2018 taxes, homeowners may be impacted even more so. 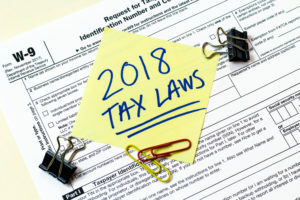 Read on as Hartz Homes explains the major tax changes impacting homeowners. Your mortgage is deductible, but you can only claim the deduction if you choose to itemize. If you bought your home in 2018, you can deduct the interest paid on mortgages up to $750,000, per the Tax Cuts and Jobs Act (TCJA). The previous limit was up to $1 million. If you bought your home or were under contract by December 15, 2017, and closed by April 1, 2018, the new limit doesn’t apply to you. Certain mortgage points that you paid when you purchased the house (or those that the seller paid for you) may be deductible if you meet certain requirements. These requirements include that the loan is for your primary residence, paying points is usual for your area, or the loan was used to buy, improve, or build your home under IRS guidelines. Previously, taxpayers could deduct moving expenses if they met the IRS criteria of moving at least 50 miles from their old home. For 2018, moving deductions are eliminated for everyone except individuals in the armed forces. Prior to 2018, taxpayers were able to deduct any casualty losses not reimbursed by home insurance, such as damage from a fire, theft, accident, or a natural disaster. However, for 2018 through 2025, These deductions have been suspended with one caveat: if the damage occurred in an event officially declared a major disaster by the Federal Emergency Management Agency (FEMA), such as the recent Camp Fires in California or Hurricane Michael in Alabama, casualty losses may still be deducted. The new tax law suspends the deduction for home equity interest from 2018 to 2026. There are several exceptions to this new law, though. If the loan is used to buy, build, or substantially improve your home, then you can still write off the interest, but if you are using the loan to pay off credit card debt, you are out of luck. Deductible home improvements projects include such things as additions, new roofs, and kitchen renovations. Did you sell your home and make a killing this year? That’s great—and it gets even better: you don’t have to report property gains from the sale of your primary residence. Single filers can exclude up to $250,000 and joint filers can exclude up to $500,000. What if you stand to profit too much on your home sale and go above the $250,000 limit for singles filers and the $500,000 limit for joint filers? You can still keep money in your pocket if you keep all your receipts for the improvements and additions you do for your home. Yes, you might keep your house 25 years and rack up a lot of receipts, but all the improvements you do will add to your cost basis and reduce your taxable gain. In the past, home office tax deductibles were available to all employees, not just those who were self-employed. Prior to 2018, employees could deduct any business expenses as long as the total cost was greater than 2 percent of your adjusted gross income. For 2018, though, employees cannot write off unreimbursed employee expenses, including home office use along with auto and travel expenses, and work clothes. New to the freelance world? If you are a self-employed or an independent contractor who conducts your principal business in one area of your home, then you can write it off on your taxes. The IRS makes this itemized deduction simple by allowing the calculation of $5 per square foot of home used for business (maximum 300 square feet). Homeowners used to be able to deduct all the property taxes they paid over the course of a year, but now that deduction is limited to $10,000 and that limit includes state income taxes, too. That combined $10,000 deduction limit applies to your state and local property taxes and personal state and local income taxes. If you need to add ramps or widen a doorway in your home to accommodate an ailing parent in a wheelchair, those improvements can be deducted from your income as medical expenses if they are medically necessary. For this deduction, tax payers must itemize their tax return and must exceed 10 percent of the adjusted gross income. Note: Hartz Homes is an expert at building beautiful homes but is not an expert in tax laws. While we believe that this information is correct, Hartz Homes is not responsible for the accuracy of the information in this article. You’ll want to consult with a tax expert as you make decisions about taxes and deductions.